I used Daisy Sitting Pretty and a sentiment from Papertrey Ink. Daisy was stamped, colored with Copics and cut out. I added an extra pair of legs popped up with scrap cardstock punches and then popped up the whole thing with foam boosters. I hope you like it and TFL!! Grab Our Cute Badge Contest! We have another awesome YNS Starlet Blog Hop coming on March 3rd! YIPPEE!!! Then your name will be entered in a random draw for some YNS stamps!!! YAY!!! The winner of this contest will be announced at the end of the hop on March 18 along with the hop winners. Thank you very much for your help spreading the word about our Hop! You can see all the different pieces I used to make my finished Lala - the whole Lala, the paper pieced dress with a little coloring on the trim parts, and an extra piece to go over the dress with her arms and the bear. The little white bits above the arms actually slip behind the sleeves of the pieced dress. I do my piecing this way because it looks much more realistic in person. And if you're wondering why I colored the bear on the full Lala, it's because I wanted to test the colors and knew that bear would be covered up anyway so it didn't matter if I messed him up! Lastly, for the sentiment, I punched out a circle, stamped the sentiment (from Papertrey Ink), and glued Prima flowers that I cut into individual petals all around the back. I hope you like it! If you're looking for the Your Next Stamp Challenge #10, it's the post directly below this one. Thanks! I used Rosie with Bird and a sketch from I Heart 2 Stamp (turned on its side). I stamped Rosie, colored her with Copics, cut her out and mounted her on foam boosters. I distressed the edges of the papers with my scissors, and sponged the edges of the white papers with red ink. I finished it off with some sewing, a flower and a button tied with crochet thread that I colored with a Copic to match. Finally, the sentiment is from Papertrey Ink. Yay! I have another Your Next Stamp Challenge today! Our theme was chosen by Angela and is to use Spring colors. I love Spring colors and papers so I was really happy to see this theme! I used Fhiona's Pet Bunny (which is also available in Fhiona's Pets and Fav Treats set. I decided that I wanted a different tilt to the bunny's head so I stamped the image twice, cut out just the head of one, and the body and just a bit of head of the other. Then I stuck the extra head over the body at the angle that I like with a foam booster. The sketch is from Sweet Sunday Sketch Challenge, the papers are from Making Memories and the sentiment is from Papertrey Ink. I'm also submitting this for Cupcake Craft Challenges - Keep It Simple. 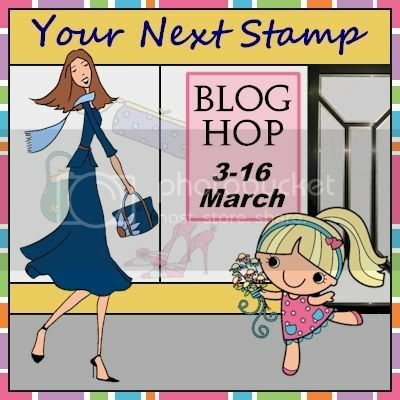 I have a special Your Next Stamp post today because we released some fab new stamps! Not only do we have 4 new Franfrou designs: Lucky the Dog, Henrietta the Hippo, Pico the Porcupine and Vacation Don, but we also have Fhiona's Pets and Treats! They may be all bought together, or you can get the Treats as a small set and all the Pets are available individually! And here's something just as awesome - how would you like some free YNS Stamps???? Until Wednesday February 17th at midnight EST, Karen is giving away a FREE Stamp or Stamp Set of your choice for all orders over $60!!!! Just enter your stamp choice in the comments section during the checkout process!!! YIPPEE!!! Please make sure to stop by the YNS Blog to see all the new release projects made by the Starlets, and while you're there you can enter to win $20 in YNS Bucks!! I've seen a number of people stamping on kraft and then coloring with Copics, and I really like the look so I had to try it. I stamped each image with white ink on kraft, then colored with Copics and cut out using my circle Nesties. I did some sewing, embossing and distressing, then added some ribbon to finish it off. The sketch is from Get Sketchy, turned on its side. Finished card size is 4" x 9". The sketch is from Truly Scrumptious and the sentiment is from The Cat's Pajamas. Finished card size is 4.25" square. I hope you like them and TFL! It's not Wednesday, but I have a La-La Land card for you because it's my fellow DT member, Kristine's birthday today!! A bunch of the DT members wanted to celebrate her special day so we made a birthday blog hop for her! If you came here by way of Pam's blog, then you're on the right track! If you just happened upon me, then you'll want to start at the La-La Land Crafts Blog to see the special post done in Kristine's honor, and then hop through all the stops for some fab La-La Land eye candy! I used Cupcake Rosie and kept the card simple because I adore this Rosie image and wanted her to really be the focus of the card! The sketch is from Sketchy Thursday and the paper is from the DCWV Rustic pad. I watercolored Rosie with Distress reinkers, distressed and sponged all the edges of the panels and added a bit of ribbon and a Papertrey Ink sentiment to finish it off. Your next stop is the super talented Kim! Kristine - I hope you like it and I hope you have the most wonderful birthday!! Wednesday means it's time for another La-La's Weekly Wednesday Challenge! This week our theme was set by Lisa and is to NOT use any designer paper (AKA patterned paper), either store bought or made yourself. I *love* using patterned paper so this was definitely a challenge for me, but it reminded me to use my Cuttlebug embossing folders, which I also love, so I was still happy with the outcome! Trying to show the versatility of La-La Land stamps, I actually used Pumpkin Lala for a Valentine's card! I just used a craft knife to carefully cut a slit right above her legs, and then inserted a couple hearts cut using my plain and scalloped heart Nesties. Before sticking the hearts in, I added a rub-on (it says adore if you can't see it so well) and cut off the bottom portion of the hearts so they wouldn't stick out below her legs. To finish off the card I added a couple pieces of embossed cardstock, hand drew a line of glue pen that was covered with superfine glitter for a border, and tied a bit of ribbon with a button and crochet thread. 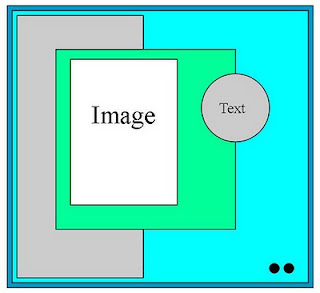 The sketch is from Card Positioning Systems. I hope you like it! There's a fun contest going on right now on the YNS blog! You could win a surprise gift pack or $10 in YNS Bucks so go check it out!! If you're looking for the Your Next Stamp Challenge #9, it's the post directly below this one. Thanks! I used the new Lala with Heart (isn't she just adorable?!) and a sketch from Mojo Monday. I stamped Lala, colored her with Copics, cut her out, did a bunch of paper piecing, and popped her up on foam boosters. Those little heart bows in her hair are from an Etsy seller and the papers are from Imaginisce. The word "hugs" was actually on the patterned paper - I used a Stamp-A-Ma-Jig to position it perfectly in the heart! And because the theme over at Secret Crafter is also hearts, I'm entering this card there as well! Yay! I have another Your Next Stamp Challenge today! It's my turn to host and I would like for you to use a charm on your project. It can be store bought or handmade if you like! All the stamps are from the Happy Birthday Mermaid set. I stamped the mermaid twice on cardstock, colored with Copics and cut out one completely, and then just the face with bangs, seashells and tail of the other. The extra head was mounted with foam boosters and the shells and tail were mounted with bits of scrap cardstock for just a little dimension. Then the entire mermaid was mounted with foam boosters. The little heart in her hair is also from the set. The turtle was also stamped twice and colored with Copics. I added an extra bottom of the shell with scrap cardstock then mounted the whole thing with foam boosters. The hearts were both cut out from the patterned paper (an old Valentine's line from Scenic Route) and the sweet sketch is from A Spoon Full of Sugar. This card also qualifies for the Creative Card Crew (Valentine's) and Papertake Weekly ("Love Actually"). Also, I will be choosing my favorite card, and that winner will get the YNS Challenge "Top Pick" blinkie to proudly display on their blog PLUS $5 in YNS Stamp Bucks! You must use a YNS image to be eligible to be chosen for Top Pick.